We are now at the far East of the verdant Island of Hvar. A wonderful island that packs more bucks for its pound than many more well-known watery surrounded land masses. But enough of that, Hvar will be the subject of the next instalment. In the meantime my faithful followers you have to put up with our posting about Split and the start of the ferry journey over. Croatia’s second largest city and a mecca for cruise ships, gawping tourists, lazy waiters and a lemon-face inducing drainage system. 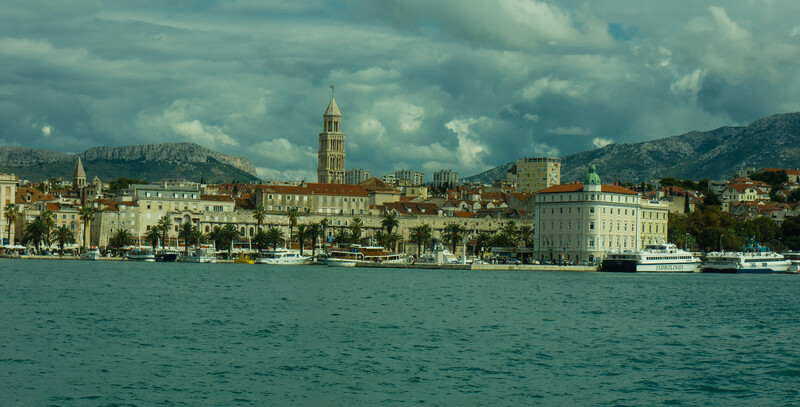 We ourselves arrived into Split by boat, taking the ferry from neighbouring Trogir. This was a one hour journey upon an ancient Catamaran devised vessel. Stop thinking of some high mastered sloop with netting in between each hull. No, this was like a tug boat where someone had taken a large sledgehammer to the front, or bow section as corrected by Tracy. The journey from Trogir to Split was both uneventful and uninteresting to be honest. So much so that when the cleft-chinned craft swung a left into Split harbour the scenery was not met by gasping passengers. Entering Dubrovnik harbour, it aint. Matters were made slightly worse by a woman bearing a life-like resemblance in shape, size and manner to Clarissa Dixon-Fat-Lady who had an unusual and somewhat nervy love fest for Cunard’s Queen Elizabeth, one of three Cruise vessels docked. She physically bullied her hapless companion to ‘Come see the QE2, quickly it’s the QE2, Daphne, come before she sails’. At which point Tracy, being from a nautical family lent over and quietly but firmly stated ‘I think you may find the QE2 is permanently docked in Dubai and the ship you are lusting over is in fact the Queen Elizabeth’. Clarissa Dixon Fat-Lump stormed off at such a pace from one side of our plucky ship to the other that we nearly capsized. A picture of the Ships and our entrance to the Harbour. Our initial fears of seeing those cruise ships docked were founded as soon as we got off and headed for the main promenade. The city was awash with beanie hat, three-quartered length trouser, Polo shirt wearing cruisers, they hang around in clumps like badly-dressed hornets nests shouting and picture-taking with too much gay abandon for our liking. Coffee. We sat down at a café for some caffeine based boost to escape being trampled underfoot by the gathered hordes. After waiting for about ten minutes and becoming slightly agitated we looked up to find the entire waiting staff were in an upstairs window having a fag and laughing at all the poor sops like us waiting to be served. We left. The second place was an improvement in that we got served but we were getting the impression that the hostelries of Split do not have to put too much effort in to make a quid or two. Refreshed we headed into the old town snappily titled The Diocletian’s Palace. This Unesco recognised antiquity is one of the best examples of Roman architecture in existence. It is pleasing to walk around with one’s eye catching delicately placed balconies and arches up within the infrastructure. Less pleasing was the undercurrent of this place, it seems now only to exist to extract money from one. 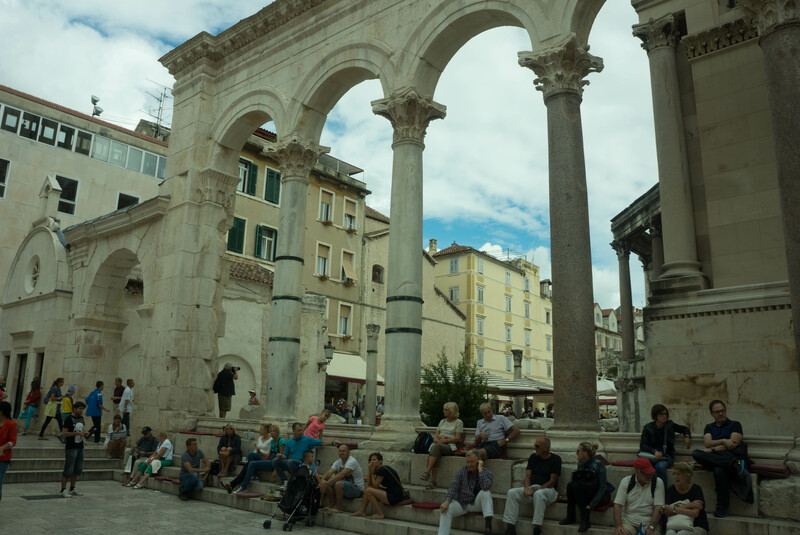 Split was now effervescing the same money-oriented grabbing perfume of Rome. OK, it does not have the half built football stadium, the church with the hole in the roof or that bit in the middle with all the columns lying about like a Bermondsey scrap-yard. But it is like a member of the same family without doubt. After the Palace we walked around the old town streets and then headed back to the prom to get some Hollywood pictures of Split. Unfortunately, the leisurely stroll was interrupted by the foul smelling drainage system. It was awful and we were there not on a particularly hot day. As you can guess we beat a retreat faster than the German army from Mother Russia and headed for the green-spaced hill of Marjan. We managed as far as the bar at the top of the stairs where we sat down, had a couple of scoops, before scooting back down for a few last pics and the boat ride home. Me: ‘dobri dan, may I have a ticket to Hvar for my wife and motorhome’. So there we are. I pay for a ticket for a motorhome 2 meters less than we are and the second dimension warping of the trip and this time coerced by a member of staff. Needless to say there was not even a shrug of the shoulder as we boarded the ferry for Hvar. Tracy’s Take. So what is surprising about that? Men are always saying things are bigger than they are. I will leave you with a picture of the ferry and me having some food.